Be a Major Donor – When your cash donations to the Foundation total at least $10,000. There are 315 Major Donors in the District. Be a member of the Bequest Society – When you commit a total of $10,000 or more to the Permanent Fund of the Foundation via your Estate Plan. There are 68 Bequest Society Members in the District. Be a Grand Donor - When your cash donations to the Foundation during the current Rotary year reach $1,000. These generous Rotarians will be recognized at the Major Donor Reception held at the District Conference each year. In addition to recognition, Triple Crown Donors receive a special lapel pin. There are many District Rotarians who have accomplished two of the three objectives. We are hoping that they will complete the third objective and become Triple Crown Donors during this Rotary Year. 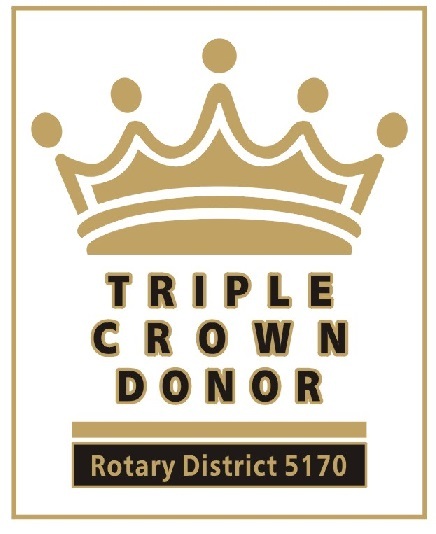 Please note that a person is recognized as a Triple Crown Donor only for the year in which they meet all three criteria. That means that there are no Triple Crown Donors at the beginning of July. The recognition has to be earned each year.